This is the second part of the activity I did using Christopher Danielson's new book project "Which one doesn't belong?" It's the math provocation/experience in a new math poetry project I'm developing. If you haven't already, make sure you read the first conversation I had with this 3/4 class here. You're gonna' want to because you will get to see me exert considerable energy helping the kids develop a concept of sameness and then nudging them on to similarity. This post is gravy compared the first 20 minutes of class! I debated whether or not to summarize these conversations, but as I was transcribing my recordings I found the progression of ideas really interesting (including my own struggles to figure out what the kids were saying and what they meant!) That's all to say: here's another transcript! Enjoy! Me: Let’s make a list. I think, from going around the groups, I think everyone had similar reasons but let’s just make sure. Who had the blue background? It’s the blue with green shapes. And it’s interesting that we had talked about color being a way to sort out differences but that’s not an option here, so you had to think about it a little differently. If you didn’t have this card, I’m going to put it here on the board so you can get a sense of what we’re talking about. Who wants to start? Kid 1: Well, three of them have six sides and one of them had five. Me: Great. Who else wants to share another way they sorted out one that didn’t belong. Kid 2, pointing to the three hexagons: Well, these are all diagonalish, and the other one is not. Me: So I’m going to write on the board “three are diagonalish’ Aweseome. Who else has something to share. Kid 3: Three of them were made out of original shapes. Me: Can you tell us about that? What do you mean? Kid 3: Like pentagon, hexagon and the other one is made out of squares. Kid 3: That’s NOT a shape. Me: So if I write…I’m going to bracket this because that doesn’t include three of them, you’re not excluding one. 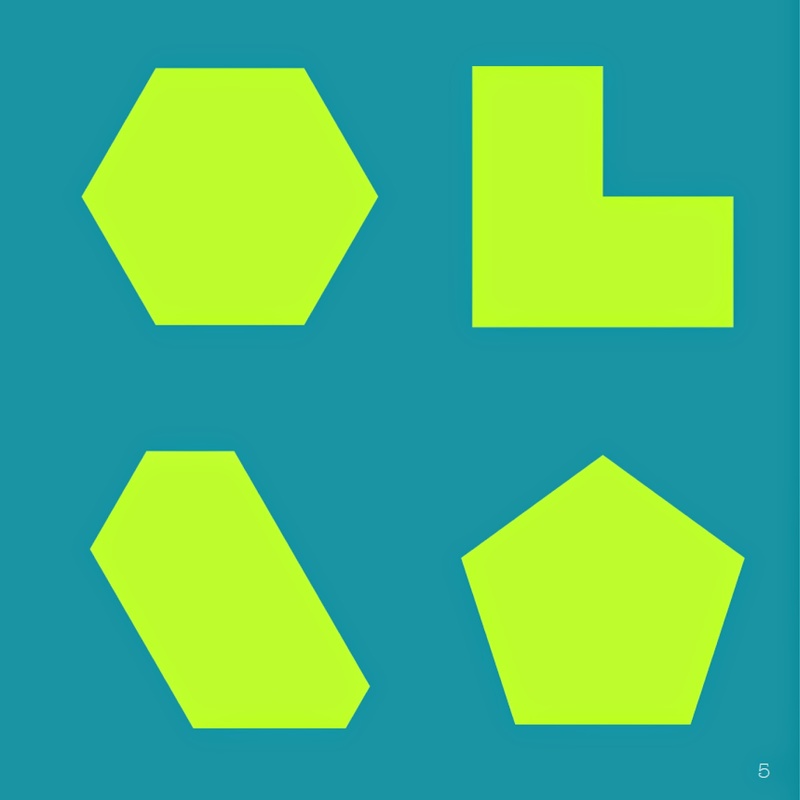 These and these you recognize as shapes. Kid 3: Yeah, that’s made out of squares…and that isn’t. Teacher: It’s not like an identifiable shape. Me: Made out of squares….okay I’m going to un-bracket that, now I understand! Thank you! What else. Kid 4: One has an odd number of sides, the others have an even number of sides. Me: Who else had this picture? Does anyone else want to add some more? Kid 6: Another one is that three have obtuse angles. Kid 6: What I mean is that on the paper, only the one with the squares have right angles that are kind of like perfect almost. The rest of them are more open and obtuse. Kid 7: One of the rectangles is the only one with an outline. Me: What’s another category for this one? Kid 8: Three of them have right angles, one of them does not. Kid 9: These three are not like this one. Me: Okay, I want to take a minute to talk about this because I think a couple groups mentioned this. 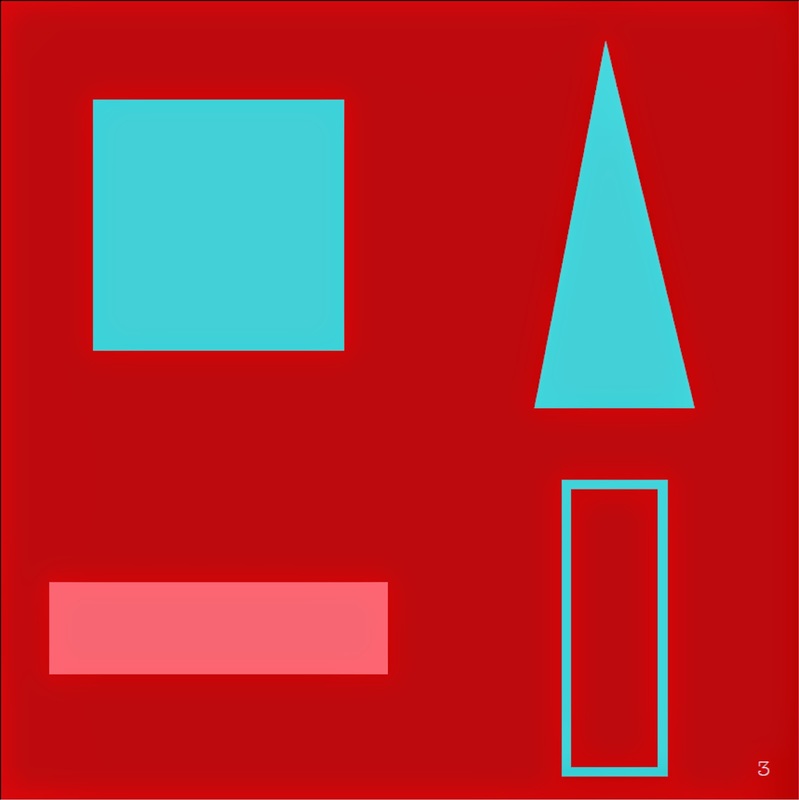 There are three are not like the square, but when you look at the three? Can you see why they’re putting them into that group? Kid 1: Well they’re all longer. Me: Oh, longer is an interesting reason. What were you guys saying about it? Me: Did you basically tell me, although it took me a long time to understand what you were saying, is that they are not squares. So that the thing they have in common is that they’re a negative. They are not squares. Anything else? Kid 11: Okay, so, one has three sides and the others have 4. Kid 12: One is red and the rest are blue. I am so impressed with your thinking! This was SO fun! Here’s what’s going to happen …next time we’re going to take this idea of sameness and difference and we’re going to write some poems [pdf of project description here]. And do you remember the c rods we used to make our faces? We’re also going to use those to design our poems. Labels: Christopher Danielson, Math Poetry Project, Talking Math with Your Kids, Which one doesn't belong?